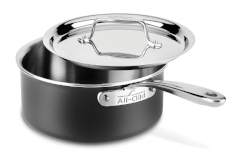 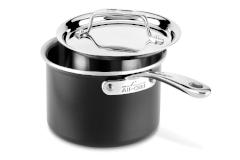 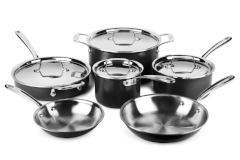 The All-Clad 10 piece LTD cookware collection combines elegance and professional performance. 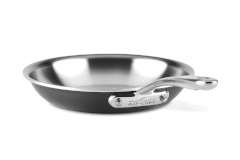 A thick, conductive aluminum core and a high-performing stainless-steel cooking surface work together to quickly and evenly distribute heat for exceptional cooking performance. 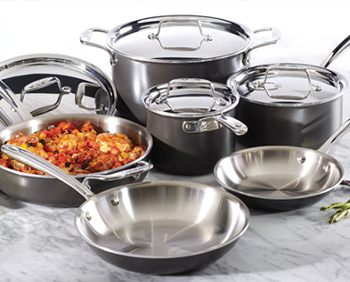 The hard-anodized exterior of the LTD cookware offers the durability of a scratch-resistant surface, while adding contrasting visual appeal when paired with the stainless interior. 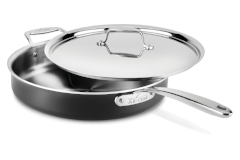 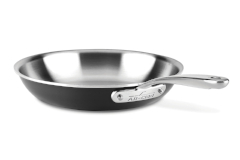 As an added bonus, the pans offer easy handling with ergonomic stainless-steel handles. 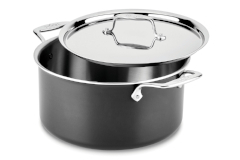 The LTD collection is made in Canonsburg, Pennsylvania.